This chapter focuses on the importance of planning for critical thinking in language arts instruction based on the Caribbean classroom. 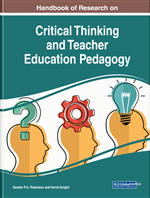 It seeks to identify traits of critical thinking, outline suggestions for planning for the inclusion of critical thinking, and highlight methods for incorporating critical thinking into language arts and provide solutions and recommendations. The chapter ends with suggestions for future research directions and summarizes the importance and many benefits associated with critical thinking in language arts. Thinking is a basic human function in all individuals, manifesting itself in the form of “problem solving, decision making and creative thinking” (Tosuncuoglu, 2018, p. 20). Due to the fact that thinking is natural and automatic to the individual, it occurs without consideration of any intervening factors, and so tends to be selfish, myopic and uninformed. In order to validate one’s thoughts, some level of effort must be applied to this automatic thought process to give it some direction (Tosuncuoglu, 2018). One of the most fundamental aspects of critical thinking is its ability to actively encourage educational growth within a technologically changing world. As technology evolves, human thinking should also develop to foster future advancements. Although critical thinking in the classroom may be perceived as a simple task by some, it requires planning to adequately manage and achieve goals within learning environments. Planning and critical thinking coincide as planning requires thorough internal debates about the goal optimistically to be achieved and appropriate methods for achieving it. It “involves deciding on a future desired state and the course of action to get there” (Spoelder, Lockwood, Cowell, Gregersonand, & Henchman, 2015, p. 383). The planning process is a natural occurrence which we often take part in without a conscious awareness. For instance, people often make plans to attend events, for daily and weekly routines or in some cases to achieve academic or business objectives. First Order Thinking: Allows for the student to respond to questions using existing schema, intuitive and creative and does not strive for conscious direction or control (Elbow, 2010, p. 37). Planning Cooperatively: A practice where the teacher uses ideas based on analysis of what has occurred during class and where much of the planning of the teacher stems from the work of the class. Language Arts Instruction: A particularly important area in teacher education, that focuses on the teaching of listening, speaking, reading, and writing; instruction in Language Arts is essential to learning and to the demonstration of learning in every content area. Teachers are charged with guiding students toward proficiency in these four language modes, which can be compared and contrasted in several ways. Critical Reading: Learning to evaluate, draw inferences and arrive at conclusions based on evidence (Zintz and Maggart, 1984); a skill which is dependent on critical thinking. It teaches students to evaluate or question texts. Barbados: Barbados is an island country in the Lesser Antilles of the West Indies, in the Caribbean region of North America. It is 34 kilometres (21 miles) in length and up to 23 km (14 mi) in width, covering an area of 432 km2 (167 sq mi). It is situated in the western area of the North Atlantic and 100 km (62 mi) east of the Windward Islands and the Caribbean Sea; therein, Barbados is east of the Windwards, part of the Lesser Antilles, roughly at 13°N of the equator. It is about 168 km (104 mi) east of both the countries of Saint Lucia and Saint Vincent and the Grenadines and 400 km (250 mi) north-east of Trinidad and Tobago. Barbados is outside the principal Atlantic hurricane belt. Its capital and largest city is Bridgetown. Language Arts: A curriculum area which includes the process of studying and constructing meaning, inquiring and presenting ideas through reading, writing, listening, speaking, viewing/visual media. Foundation Knowledge: Information provided to students which they utilize to make informed decisions. Institutional Culture: A particular set of rules and norms that govern an organization. Critical Thinking: A skill based on an individual's ability to provide informed opinions on the basis of synthesizing new and existing knowledge. Information Fluency: The ability to not only accumulate but to organize information to determine relevance. Second-Order Thinking: Requires the student not just to use schema to provide random answers, but rather has the students think about their thinking before responding to questions.